This post covers minerals M through R.
Marble is formed from the metamorphism of limestone. It is mostly comprised of crystals of aragonite and dolomite. The name derives from the Greek for “shining stone”. Pure white marble comes from very pure limestone. The swirls seen in most marble are impurities from clay, silt, sand, iron and other materials. Green coloration is usually from the presence of serpentine. Marble’s relative softness, resistance to shattering, and color made it a popular medium for sculpture and architecture. Mercury, also called quicksilver or hydrargyrum, is the only metal that is liquid at room temperature. It is a silvery metal found in deposits of calomel, livingstonite, corderite and cinnabar. Cinnabar is a scarlet to brick red mineral that is found in alkali hot springs and near volcanoes, often with dolomite. Mercury is separated from cinnabar and other minerals by roasting. The mercury condenses easily into a condensing column and then collected and shipped in iron flasks. Alchemists would heat elemental mercury with aqua fortis to prepare mercuric oxide. The reaction produced a thick, red vapor over the surface of the solution, while the mercuric oxide fell out of solution as red crystals. The oxygen released from this solution was called “dephlogisticated air” by Joseph Priestley. Cinnabar is a source of vermillion, an orange-red pigment that has been used since prehistoric times. To the Romans, who called it minium, It was the most valuable pigment. The imperial government fixed the price at 70 sesterces to the pound, ten times more expensive than red ochre, because of the incredible demand and the short supply of cinnabar. Like many ancient pigments, it was toxic. The Olmecs and Mayans relied on its toxic reputation to repel tomb robbers, putting it in burial chambers and inserting it into limestone sarcophagi. The Chinese used it in carved lacquer ware, the layer of lacquer protecting people from the toxicity of the cinnabar. Mercury dissolved gold and silver, making it useful in plating those two metals over other materials. Alchemists combined mercury with tin, sal ammoniac and flowers of sulfur to make mosaic gold, a yellow, crystalline powder used as a pigment in bronzing and gilding wood and metal. Obsidian is volcanic glass that occurs in obsidian flows near active or dead volcanoes. It is usually black, but impurities can make it dark green to brown and even colorless. Obsidian with fluffy white inclusions is called snowflake obsidian. Gas bubbles can produce obsidian with a golden or rainbow sheen. Obsidian has been used since prehistoric times to craft blades, tools and projectiles. It can also be cut as a gem and used in art objects and jewelry. Olivine is a greenish mineral common on Earth, the Moon, Mars and in comets. Gem quality olivine is called peridot. Peridot occurs in lava rocks. It is a rare gem and always colored olive green. Peridot is the only gemstone found in meteorites. Olivine is supposed to provide protection from magic spells, while peridot wards off enchantments. Opals are a mineraloid gel commonly found in sandstone and basalt. The water content in opals can be quite high, up to 20%. Opals range from colorless, white, gray, red, orange, yellow, blue, green, magenta, rose, pink, slate, olive, brown and black. Opals that have red against black are the rarest, while white and green opals are the most common. Fire opals are translucent, transparent opals of warm colors, such as yellow, orange or red. Opals were believed to be lucky stones and to cause invisibility if wrapped in a bay leaf and held in the hand. Pearl is not a stone, though it does have a mineral base. Pearls are produced by a living, shelled mollusk. They are made from layers of nacre, or mother-of-pearl. The best pearls are produced by oysters, but they are quite rare. In a haul of 3 tons, only 3 or 4 oysters will produce perfect pearls. The largest pearl yet found came from a giant clam, and weighed 14 pounds. White and black pearls are the most common and popular pearls, but there are also pink, blue, champagne, green and purple pearls. Phosphorus does not occur free in nature, but can be found with many other minerals, especially apatite. White phosphorus was discovered in 1669, by German alchemist Hennig Brand. It was named for Phosphorus, the light-bearer, i.e. Lucifer. The most common way of obtaining phosphorus was from human waste. The process involves boiling urine to produce a residue which was heated to produce phosphorus gas which would condense into a white powder. The powder is flammable and capable of blistering fingers and burning holes in cloth. It takes 2,000 gallons of urine to produce one pound of phosphorus. Hennig Brand eventually sold the recipe for 200 thalers (approximately 80 gp) and others eventually figured out the recipe from clues left by Brand. In 1680, Robert Boyle made the forerunner to modern matches when he used phosphorus-coated paper to ignite a sulfur-tipped wooden splint that he rubbed across the paper. Pitchblende, or uraninite, is a black mineral that contains uranium, lead, thorium, rare earth minerals and radium. The radium and lead are due to the decay of the uranium. Pitchblende was usually found with silver deposits. Refined uranium is a silvery white metal. The element was discovered in 1789 by the apothecary Martin Heinrich Klaproth, but the metal was not isolated until 1841 by chemist Eugene-Melchior Peligot, making it unlikely to have been discovered in most fantasy settings. Unrefined pitchblende, however, was added to glass and mosaic tiles to give them a yellow-green to orange-red color. This uranium glass was usually about 2% uranium. Given the composition of pitchblende, a Referee who is running a science-fantasy game might want to require it as an ingredient for making magical objects. Platinum is a silvery metal that is resistant to corrosion and acid and malleable enough to work. It occurs with copper and nickel ores, often in the sands of rivers. Like gold, platinum dissolves in aqua regia, and this substance was used to isolate pure platinum in the 18th century. More often, natural platinum, which is combined with other metals in the platinum family, is found and was worked by ancient peoples. Platinum is harder than gold or silver, and with a much higher melting point. Platinum was unknown in Medieval Europe, but the peoples of pre-Columbian Central and South America were aware of a naturally occurring gold-platinum alloy and used it to make jewelry. Once the Europeans obtained platinum, they found they had no way of making a fire hot enough to melt it, which prevented them from minting the platinum coins sometimes seen in fantasy games. Such coins, had they existed, would have probably been made from the aforementioned alloy (and thus worth 5 gp each). Imperial porphyry is a deep brownish-purple rock used to build monuments and buildings in ancient Rome and in hardcarving. It is an igneous rock that contains crystals of quartz (q.v.) and feldspar (q.v.). It came from a single quarry in the rocky wastes of Egypt’s eastern deserts. Quartz is the second most abundant mineral in the Earth’s crust after feldspar. It occurs with granite, shale, schist, sandstone, and gneiss. Pliny believed it was permanently frozen ice because it was often found near glaciers, but not volcanoes, and in spherical form would cool the hands and act as a prism. Quartz deposits often contain gold (q.v.). Many forms of quartz are precious stones. Pure quartz is rock crystal, citrine is pale yellow, rose quartz is pink, amethyst purple, smoky quartz gray, milky quartz (the most common) white, jasper reddish brown, tiger’s eye is gold and red-brown and hawk’s eye is blue. 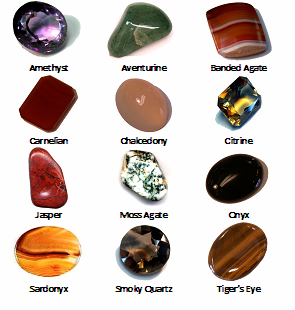 Agate, a form of quartz, comes in many varieties, including banded agate and moss agate. Onyx is a black agate with bands every color but blue and purple. Sardonyx replaces the black of onyx with brown. Both are cut into cabochons and used for intaglios (i.e. engraved gems). Chalcedony is a white or lightly colored quartz. It can also be banded. Aventurine is translucent chalcedony with shimmering inclusions. Carnelian is translucent orange-red, while sard is a brown carnelian. Chrysoprase is gemstone quality chalcedony that is apple green to deep green. The native Americans called quartz geodes that contained agate, jasper or opal “thunder eggs”. They believed that they were thrown by thunder spirits at one another. Rhodochrosite is a precious stone that varies in color from rose red to pink or pale brown. The purest form of the stone is rose red in color. Rhodochrosite occurs in hydro-thermal veins in silver ore deposits. The Incas believed it to be the hardened blood of their ancient kings. As a soft mineral with perfect cleavage, it is difficult to facet.